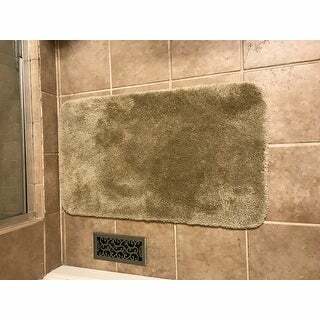 The Mohawk home Spa bath rug is made with superior quality. The rubber backing allows you to step on the mat after showering with confidence, no worrying about slips. It is extremely absorbent as well. The color is spot on magnificent bath rug. I was so proud to get this rug. I immediately washed it on the delicate cycle and dried it on low. I folded it in half and put in linen closet until ready to use. Unfortunately, I didn't get it out until last week, well after 30 days, and can't return it. When I took it into the bathroom, I saw a dark yellow line running the length of the fold about 2" wide, I can't imagine what it is. There's nothing else in the closet with anything on it. I looked at everything as I panicked. I sprayed "Spray N Wash" all over the yellow mark. I then soaked it in washing machine on cold and normal all night. Didn't come out. I then washed again with bleach in the machine. The mark may be a little lighter, but it's ruined. If you get it, use immediately and wash to see what happens. I guess, don't fold it. I took off just 1 star because it is lovely, but I had to get my old one back out. It doesn't have a 2" yellow line across it. 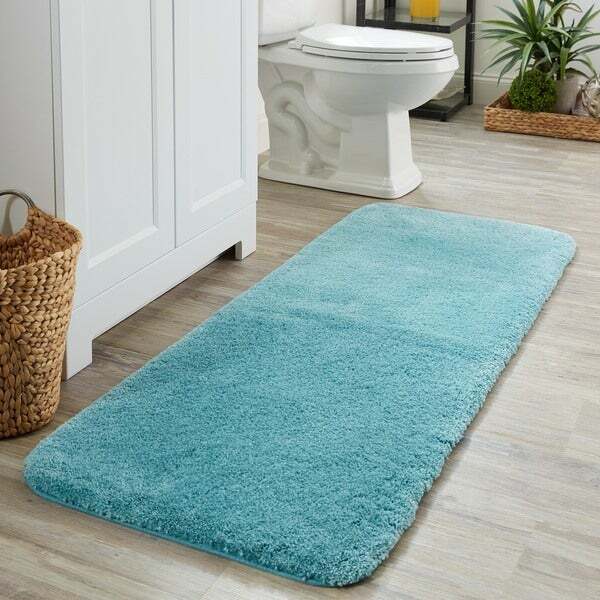 This bath rug is very plush and soft to your to stand on,the color goes perfectly with our decor. The Mohawk bath rug color in Paprika is very nice, and the color I was looking for to update my master bath. The quality of the bath rug s average but do not confuse it with the quality of a Wamsutta bath rug in the same size. It is thinner, lighter and not as plush. That said, it will e easier to launder since it is not as thick and heavy so I say that will be a plus. Very pretty rug with non-skid backing. Not as thick as I expected but definitely usable. So very happy with my purchase of the Mohawk Home Spa bath rug, Toilet lid cover and contour rug. Good heavy quality, will last for years. Quite pleased! The color was just what I wanted and the quality is fantastic!! I recommend these rugs to anyone looking for bathroom floor rugs. I was looking for a bath rug that would match a color in my shower curtain and found the Paprika at Overstock. What a perfect color match. The rug is thick and luxurious. I could not be more satisfied. Highly recommend the Mohawk spa rugs. This is a nice, thick bath mat. I got it in the green color, which is a surprisingly hard color to find for a bath mat! Haven't washed it so far, but it seems durable. Excellent quality, perfect plush! I love the color. It is exactly as pictured. I also ordered the matching contour bath rug. I will definitely be buying a different color for my other bathroom. Using in my kitchen in bright red. Doesn't slide or curl even when I use vacuum on it. 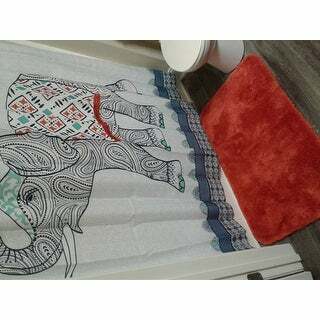 I'm very happy with this purchase..getting another one for the bathroom. The two bathroom rugs arrived with no product packaging or tags or wasing instructions. Cant return them because no packaging. Will have to throw them away because i dont know where they came from or if they are new or used or disgarded. Beautiful and very soft. It doesn’t ball up after getting wet. Dries quickly with a bright color. Very delighted with my purchase of this bath rug in such a vibrant color. This color brings images to mind of blue skies and spring breezes. This item completes my matching bath rug set purchase. Happy feet! This is a thick, rich looking rug. I am very pleased with the colors offered and quality. I will definitely look into this brand again next time I want to purchase a rug. Soft and looks great in my bathroom. Suze is just right. "I can't really tell by the picture what color Cameo is. Is it more of a blue color or does it lean more toward a turquoise/blue color? Why aren't the colors posted on this website? Can anyone tell me the exact color of Cameo? Thank you." "Is the IRON color a dark grey or is it black?" "I can’t see the colors that are offered . Could you please describe the java and latte colors?" "I’m looking for a gray and dont know what name it is called. " "I'm looking for green, but can't tell from the pictures which color goes with which name. Please help. Thanks"
I have sent a request to have the images updated with their color names.